The launch of the next iPhone is probably still months away. Nonetheless, interest in Apples next handset appears to be growing, according to AppleInsider. On Thursday, 451 Research published the results of a new survey that shows consumers really want an iPhone with a larger screen. Among those polled, 14 percent say they are very likely to buy the rumored device, with another 26 percent saying they are somewhat likely to purchase one. 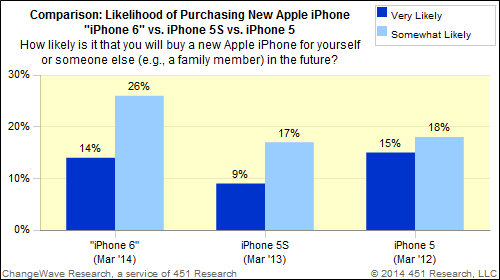 In total, 40 percent of those surveyed were either very likely or somewhat likely to buy the so-called iPhone 6. This compared to 26 percent who were likely to buy the iPhone 5s in March 2013, and 33 percent who expected to buy the iPhone 5 in March 2012. According to the report, Potential smartphone buyers were asked how interested they would be in an “iPhone 6″ with a larger display, “gesture control,” a faster processor, and updated iOS mobile operating system starting at $199 for 16 gigabytes. 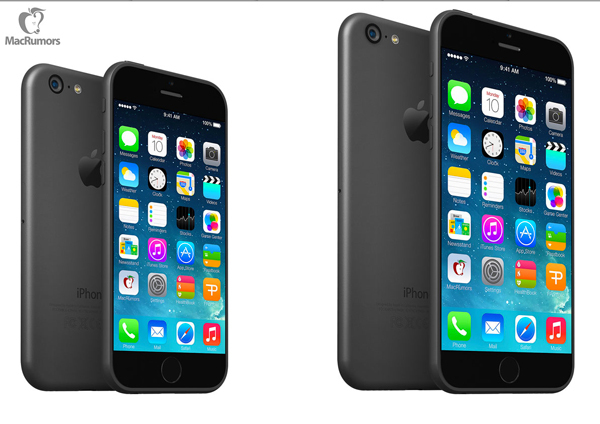 Most rumors suggest the next iPhone wont arrive until September or October. When it does, it is likely to feature a 4.7-inchscratch-proof sapphire glass screen. A 5.5-inch model is also possible. In March, Brian Marshall of the ISI Group said “large-screen envy is expected to make Apples next iPhone a huge hit with upgraders and Android switchers. In peak quarters, Marshall believes as many as 14 percent of existing iPhone owners opt to upgrade to a newer model. This compares to 9 percent in an average quarter. The analyst believes pent-up demand will push Apples upgrade numbers later this year to 14 percent or higher. See also:In China, Apple’s iPhone 5s Is Old News As Excitement Builds For ‘iPhone 6,’Three Images Leak Purportedly Showing Apple’s ‘iPhone 6,’The Latest iPhone 6 Concept Is Big, Beautiful, But Square?